i should point out, rabin, that the color choice was not mine, but my wife's. 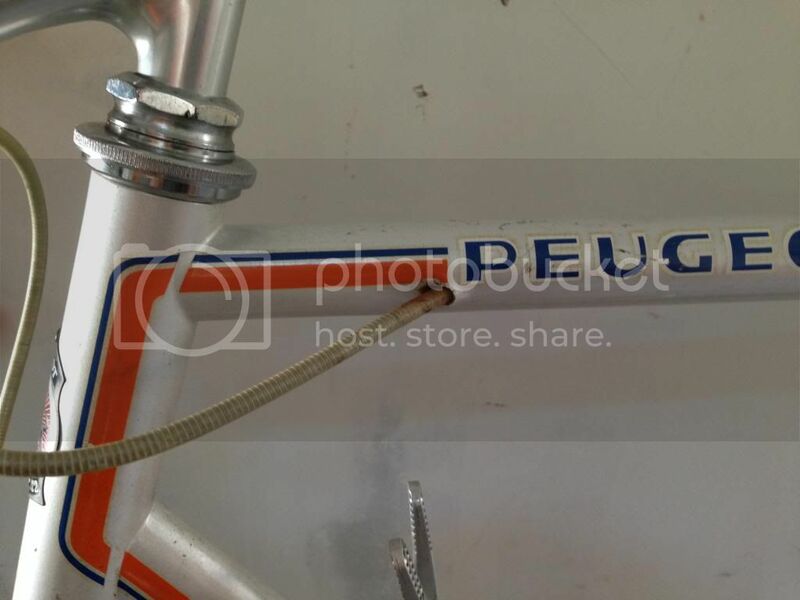 i found some nice reproduction decals at velocals that will go well on this bike, i'm going to get them done in silver. 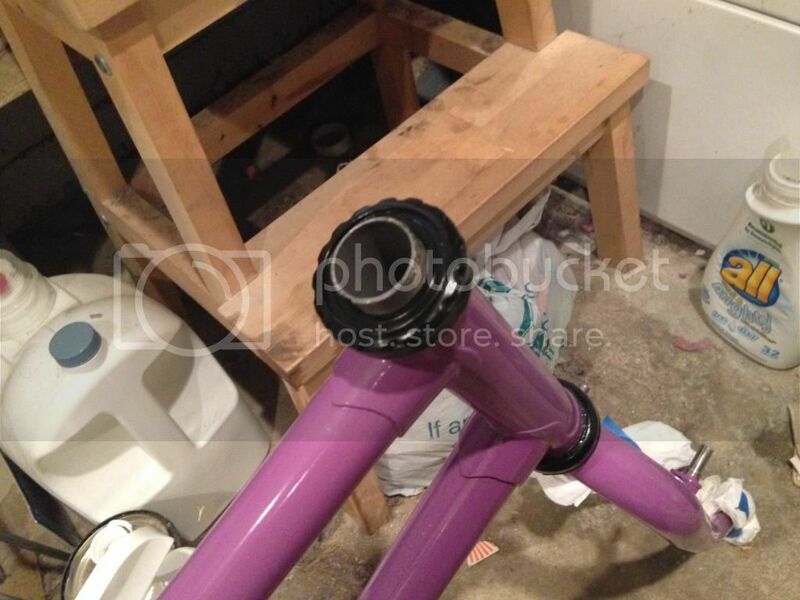 i'm pretty much replacing all of the components with new black parts, so this bike should look fairly contemporary. 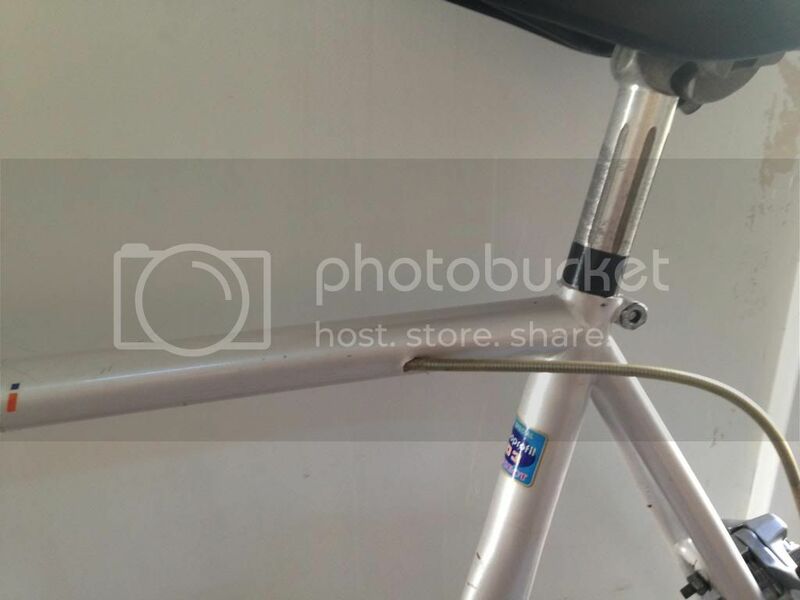 speaking of decals, most of the decals that are available for bikes are intended to be used with a two-step painting process (color coat and clear coat) with the decals going under the clear coat. velocals offers their decals with an optional uv coating so that they don't have to be coated with clear coat -- which is important for me since i'm going with powder coating and you can't really clear coat over powder. 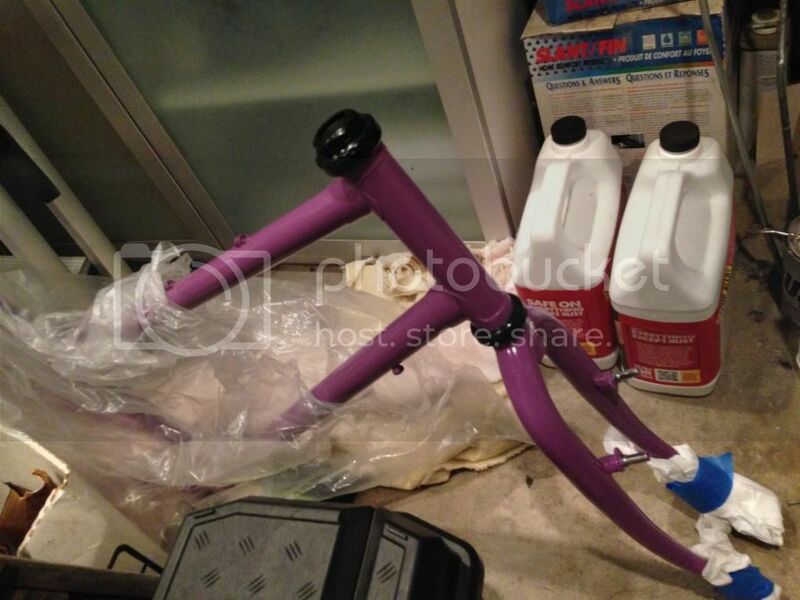 i've read online that some people who add regular bike decals but don't want to clear coat them (either they have nice paint already or they're going with powder coating like me) will cover them with clear wrap, the same stuff used for clear bras on cars...but that seems like a lot of trouble. not sure what my plans are for this one, but i'm going to keep it original -- any changes i make will be reversible. 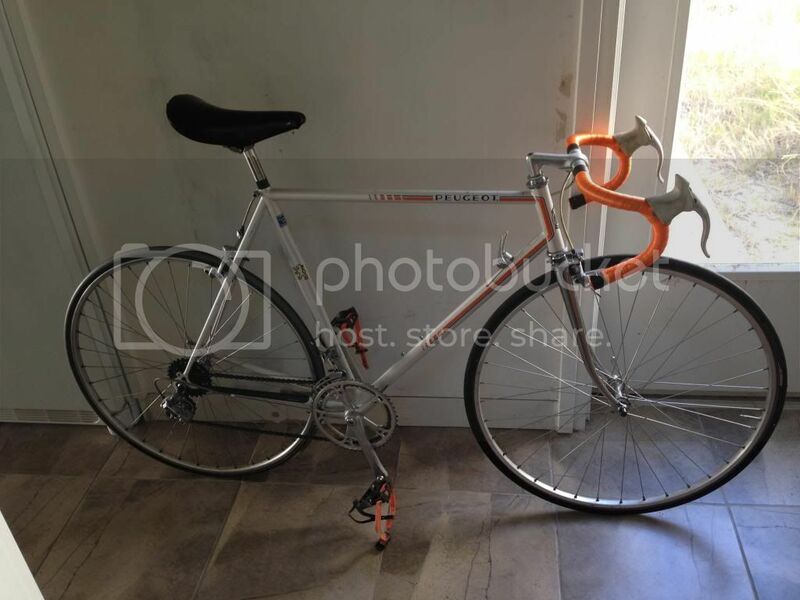 first things to go will be the orange handlebar tape and pedal straps (not original). also, if you look closely at the brake cable routing, there is a small bit of rust where the cable enters the tubing. 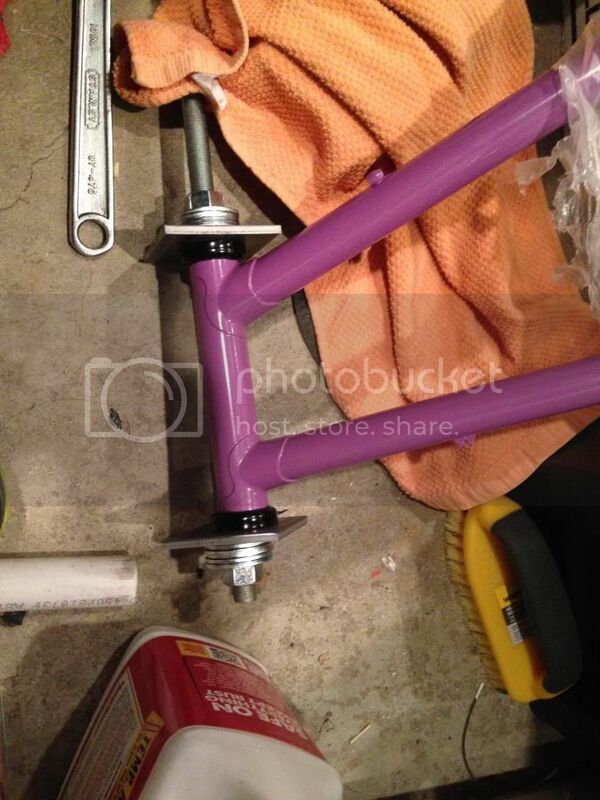 i will probably get the frame repainted at some point in the future, most likely using conventional (non-powder) paint. on the new fork, you can see the old chrome finish on the steerer (the tube that sticks out of the top) below the threaded part; the whole thing was originally like that. 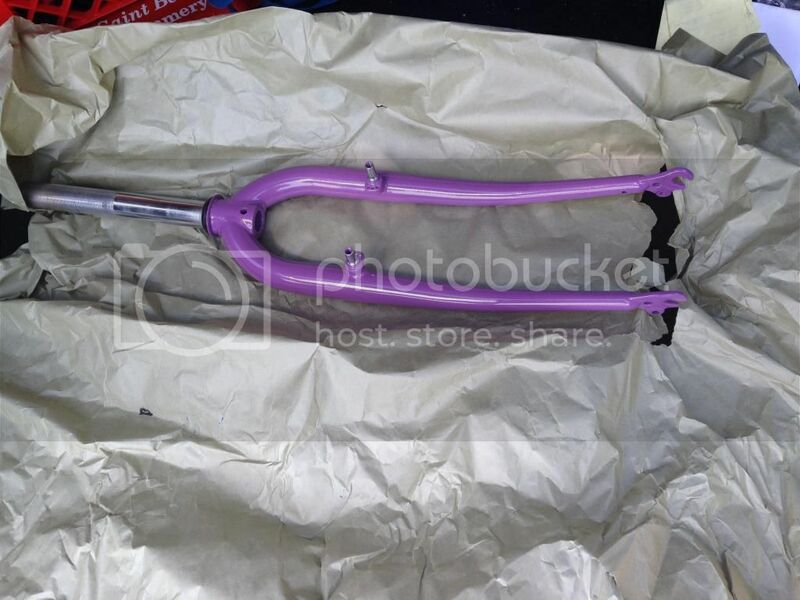 primo sandblasted the lower part of the fork and painted it to match the rest of the frame. still waiting on some components to come in, mainly the new headset but also the new drivetrain. 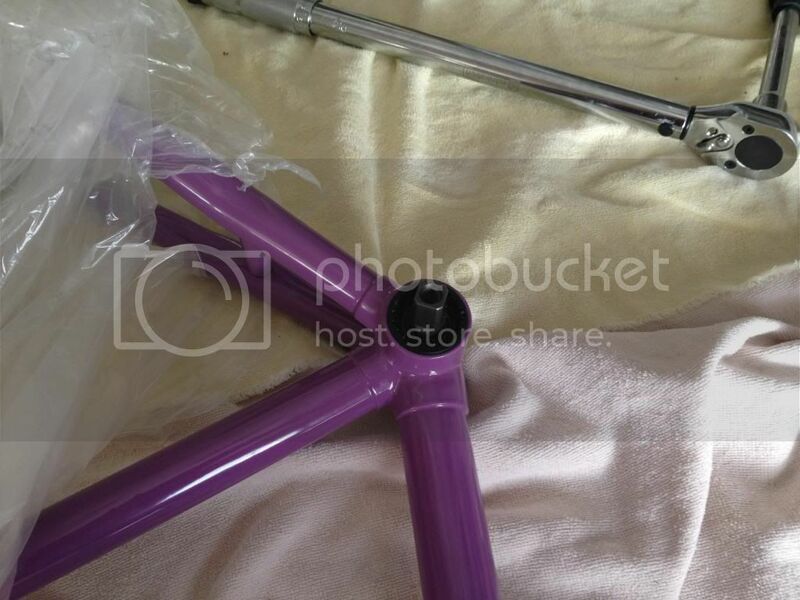 after i get those pieces put on, then i probably have one last batch of stuff to get; that batch will include the stem & handlebars, the new seat and the new pedals. should be complete in 2 or 3 weeks. in that time i also have to order the new decals, they'll be similar to what was on the bike before but the text will be metallic silver, not white. I'd highly recommend upgrading to v-brakes over the old style cantilever ones that looks like it used to have. They should bolt on, only difference is you need different brake levers. I did this on my mountain bike and it was worth every cent. That looks nice,now I want one my self lol. bike mechanics is super easy compared to car mechanics, savo, so i'm sure you'd have no troubles. plus lots of fun new tools to buy. i've always said that cycling is an ideal sport for gearheads, since there is equipment to mess with as well as the physical side of it. Just like cars - I like the best brakes possible. After riding my bike in the mountains I really want hydraulic disk brakes on my mountain bike. V-brakes are great for city rides, but descending long mountain trails I experience brake fade to the point that the pads melted and folded towards the spokes. Didn't touch any spokes thankfully, but also had no brakes. Good thing I was relatively close to the bottom - I gained a lot of speed but nothing I couldn't handle. Way to much to retrofit disk brakes, so figure I'll just continue riding it until something $$$ breaks. André your new road bike looks freakin awesome! 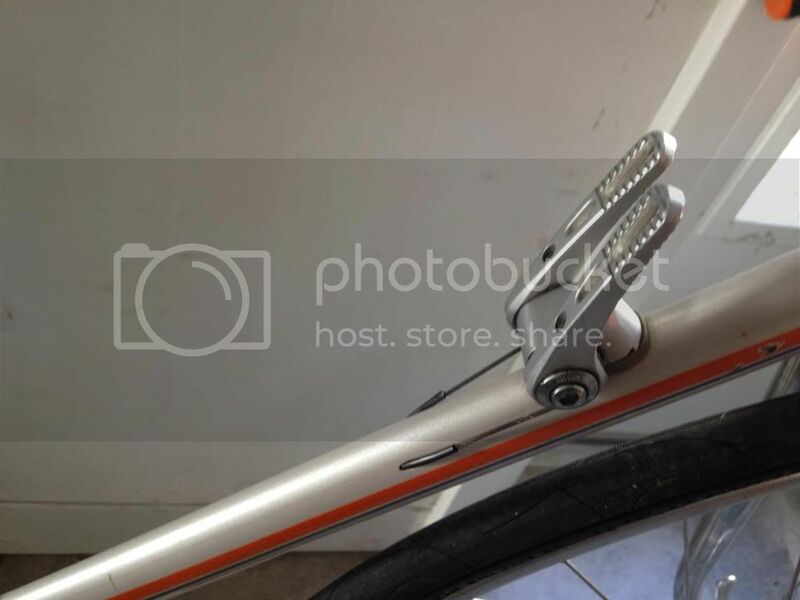 I love the silver and orange combo, and it's pretty light for one of their normally-hefty Carbolite frames. 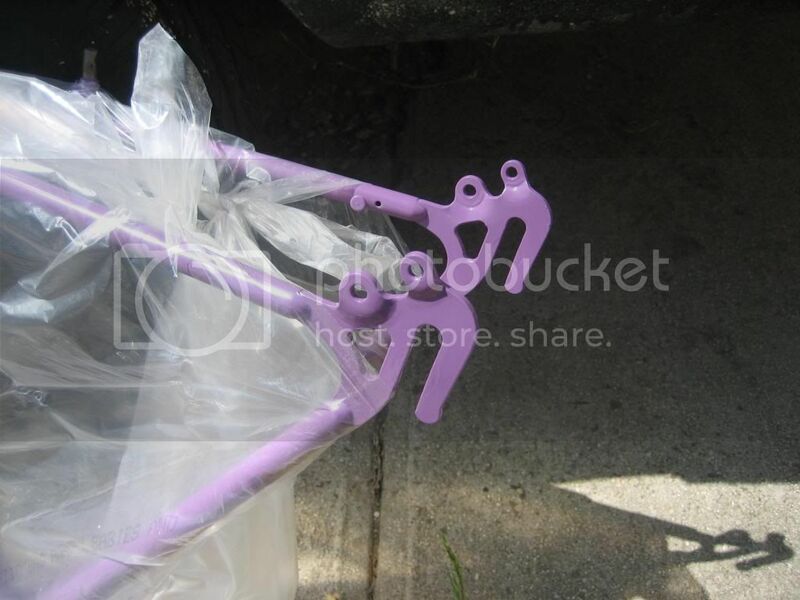 And the new powdercoat looks amazing! My headset stuff finally arrived from France a few days ago, so I'm going to start rolling on the Galaxie project again very soon. In the meantime I admit that this has become a mild addiction. 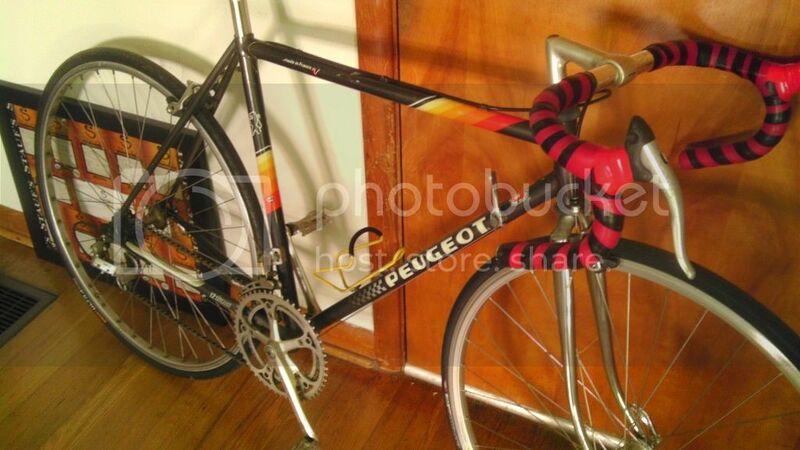 I admit I glance at CL and eBay looking for Peugeot bargains. 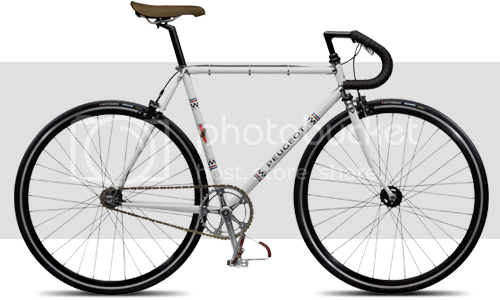 I've almost made the move on another Peugeot mountain bike (Urban Express) as well as a Triathlon with super light Vitus tubing... but my good(?) judgement stopped me. 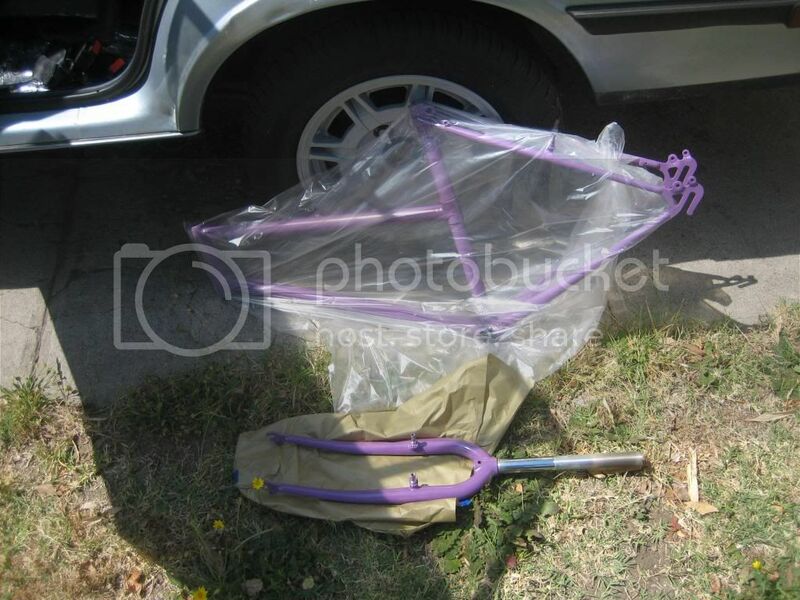 that's surprising to me -- your acura and your bikes (moto and veló) are such somber colors, i never would have guessed that you like purple and orange. Finally remembered to snap a few pictures of my Peugeot. The front wheel was took a glue-on tire so I replaced that with a standard wheel to match the back. I need to get a better saddle for it. 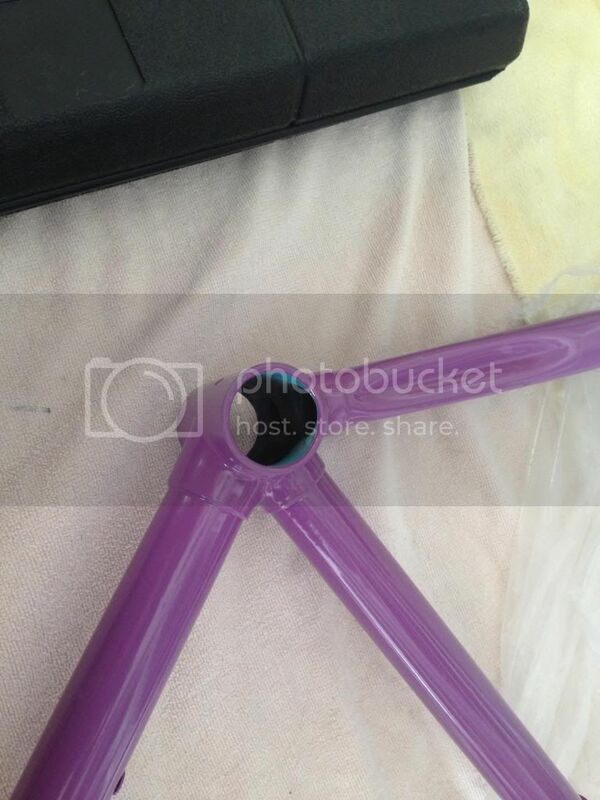 The only issue is a dent in the top tube but it doesn't seem to affect it. Bikes are looking great guys! 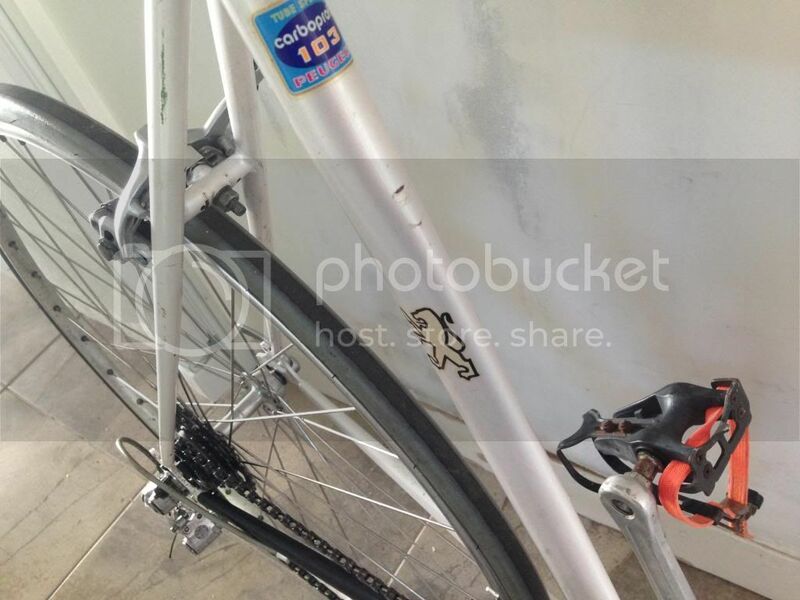 that white sleeve on the rear wheel is a foam protector for the splines on the freehub body (the part of the rear wheel where the cassette mounts). 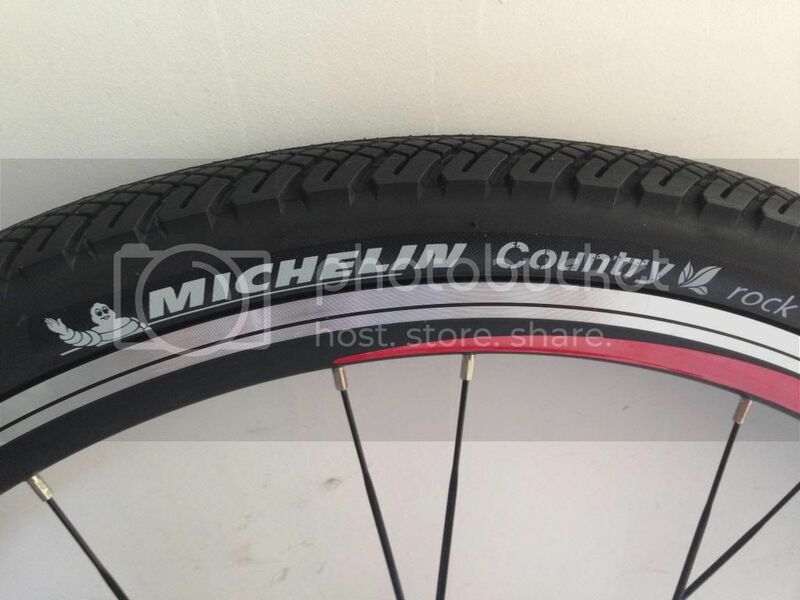 not visible are the new inner tubes and rim protector strips. i did have one setback. i was having trouble mounting the crown race on the new fork...i realized that since the fork was new, it had never been reamed. so i took it to my local bike shop, and they mounted the crown race but bent my dropouts in the process. 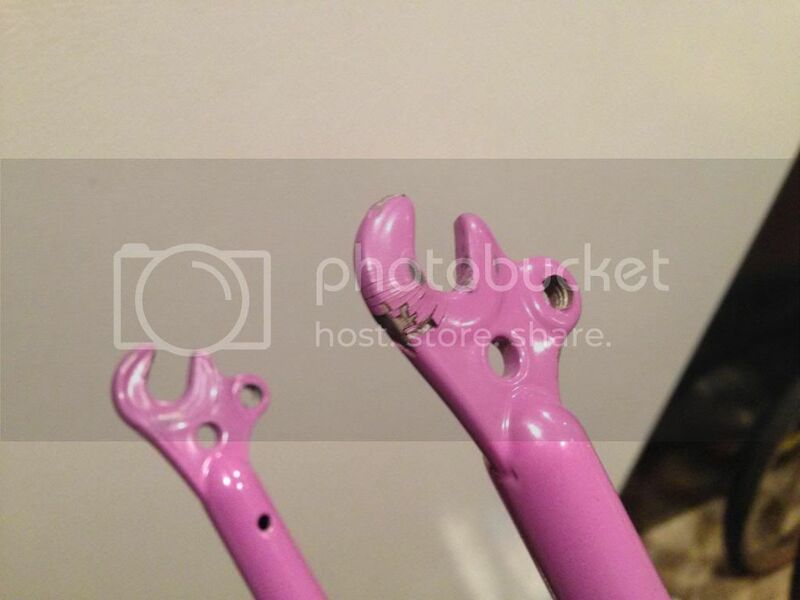 they straightened them for me but the powder coating was damaged. 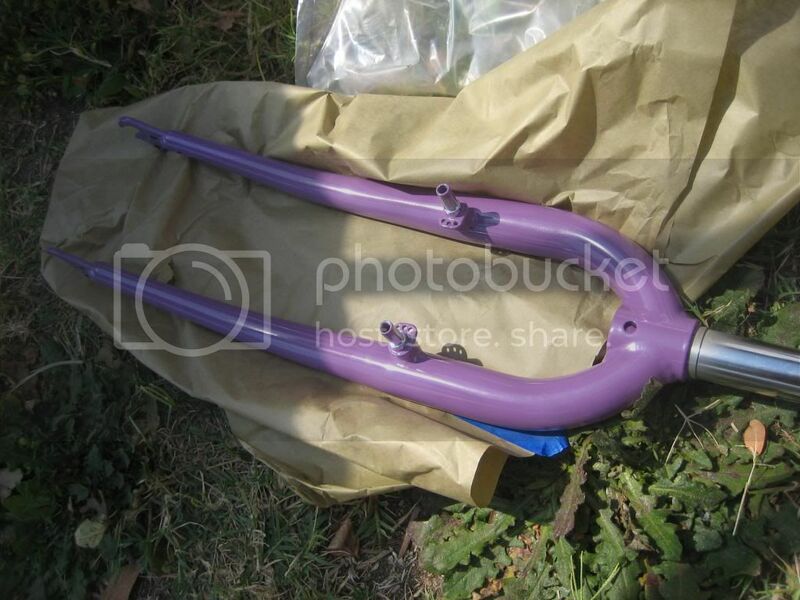 i'm taking the fork back to primo this week to be re-coated at the shop's expense. the crown race itself is powder-coated steel, so it'll be masked off during the sandblasting & painting; it'll be fine during the oven curing. 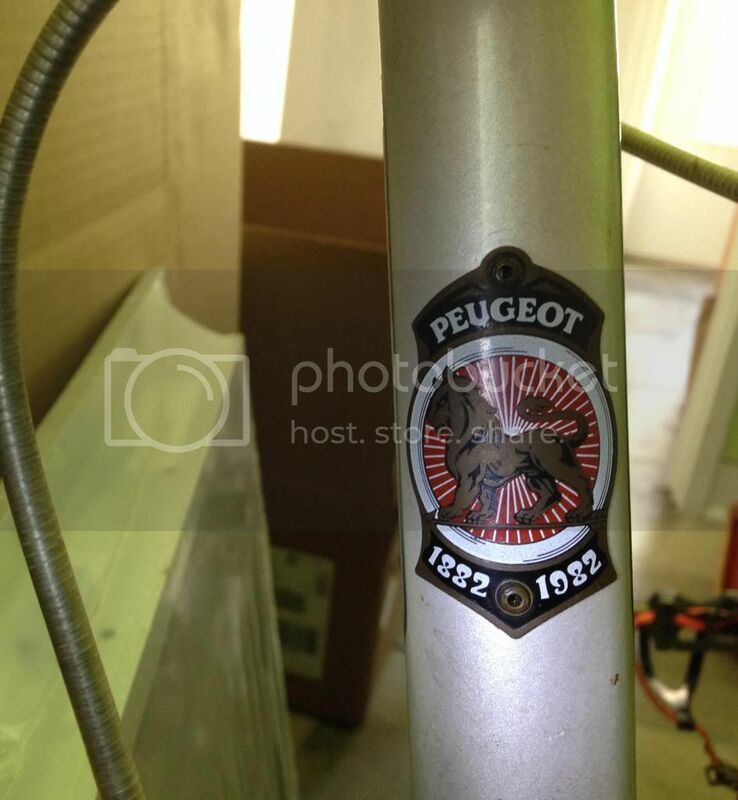 Very cool Evan - any Peugeot ownership is good for the soul. Andre - very nice work as always! Curious about the rims you're using - are they a common upgrade or are they special higher end ones? 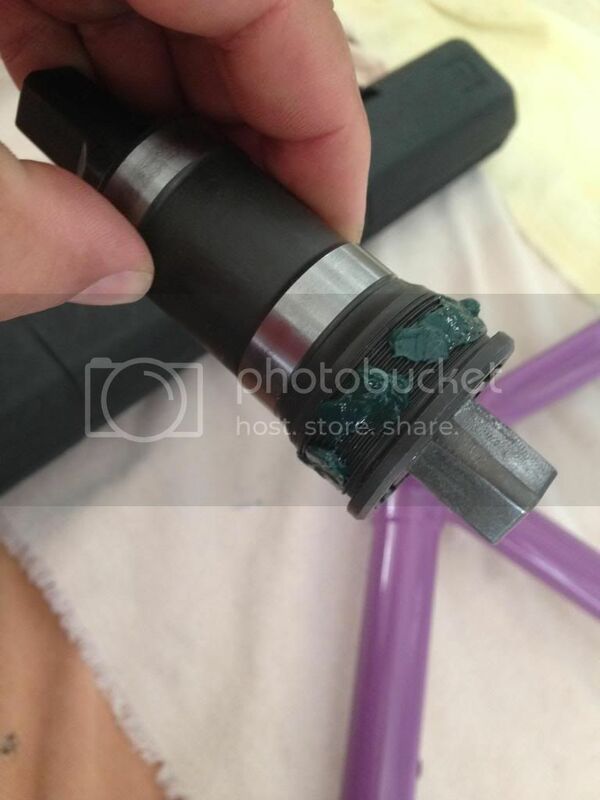 Also curious about the Presta tubes you're using - I bought a Schrader to Presta adapter for the road bike but trying to get the the PSI is tough due to leakage. Curious about the rims you're using - are they a common upgrade or are they special higher end ones? 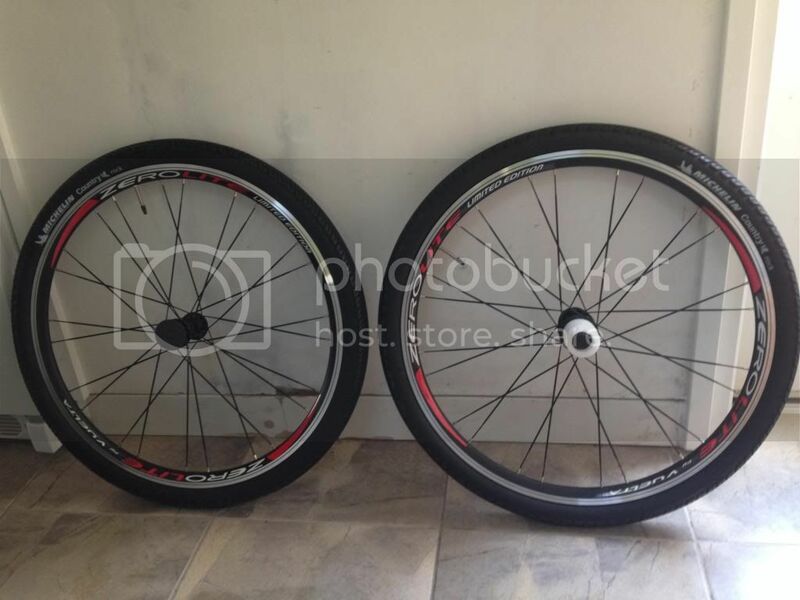 these are most decidedly not high-end rims, rabin -- they are a relatively inexpensive generic wheelset that can be found on nashbar or on amazon...basically, the cheapest non-department-store wheelset you can find. i got them for US$69 (no tax, free shipping) from nashbar a few weeks ago. even though they're low-end, they are miles better than what was on the bike before in terms of true-ness and weight savings. 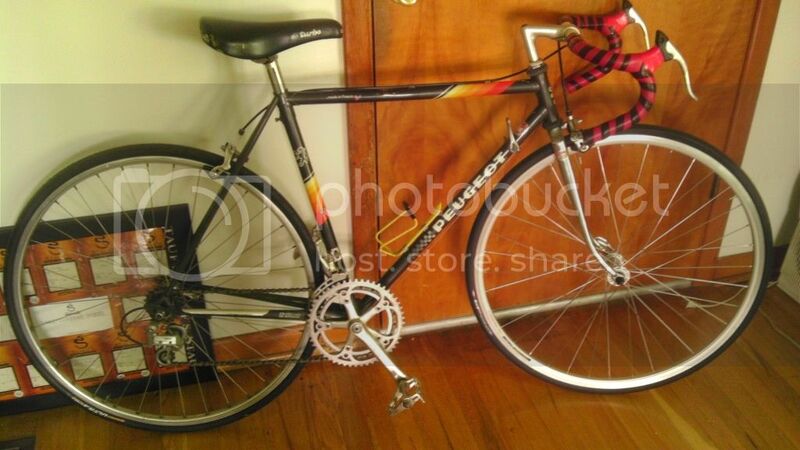 swapping out the OE wheels on a low-end bike like this is a good way to make the bike lighter, which makes it easier to ride -- especially for a non-enthusiast like my wife. the only technical issue with these wheels is that they are made with 8-9 speed MTB hubs (135mm), and i am using a 7-speed cassette (intended for 130mm hubs) since that is compatible with the drivetrain parts i'm using (triple crank x 7-speed cassette = 21 speeds). 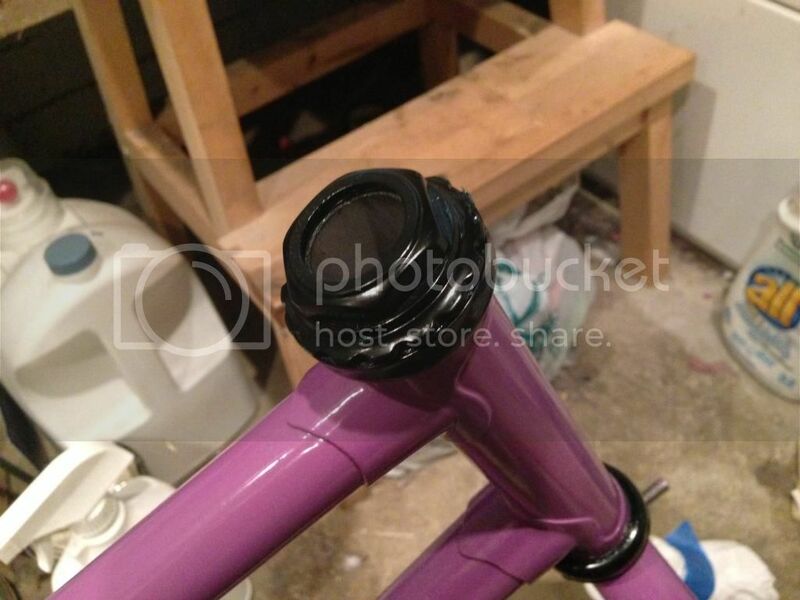 so i will have to add a 4.5mm spacer to the hub below the cassette. this drivetrain is probably a little complicated for my wife, but i'm going to be using the same parts on my own hybrid bike (i'm buying two of everything) to keep things simple (relatively speaking ). as far as getting the pressure right on the presta valves -- it's difficult to get the pressure spot-on using those little brass adapters....i know because i use them all the time! 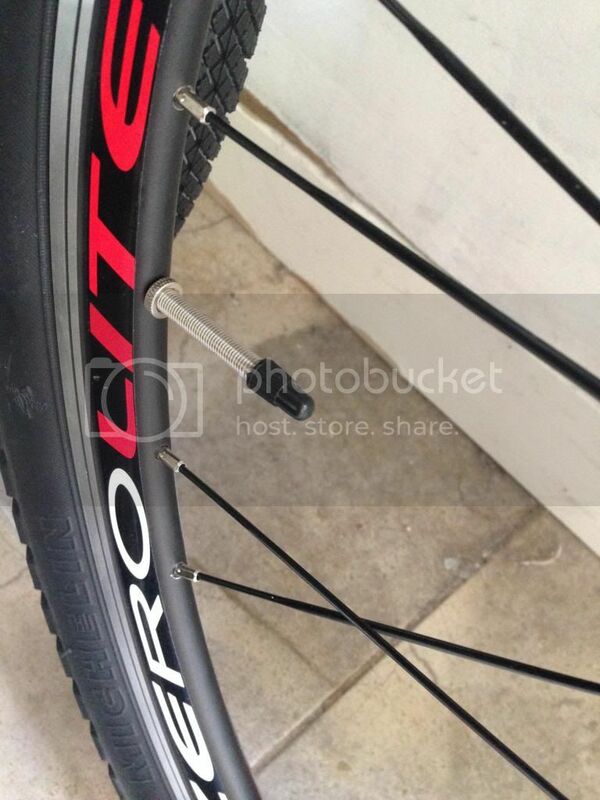 it's much easier to get the pressure correct using a floor pump with the correct head directly on the presta valve. i was down in the OC (orange county) this morning on business so i dropped off the fork for my wife's bike to be re-coated. should be done in a few days. i had a bit of time this morning before work, so i installed the new bottom bracket on my wife's bike frame. i don't have a repair stand yet (it's on my to-buy list) so i spread some old towels on the floor and got started. it occurs to me that i'm spending a lot of time keeping the frame looking nice while i work on it, when it's probably going to get scratched the first time my wife rides it. 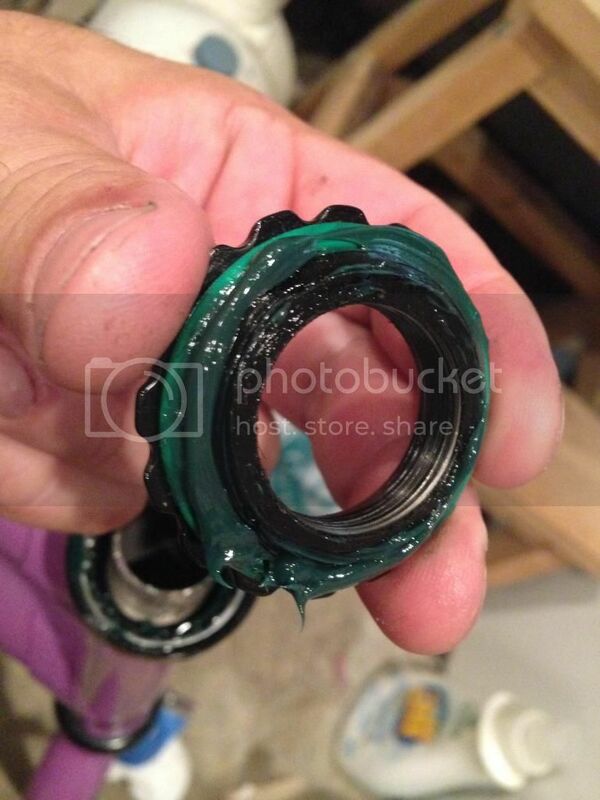 the bottom bracket (bb) i am installing is a low-end shimano part. it is a direct replacement for the old one, from which i took the measurements. 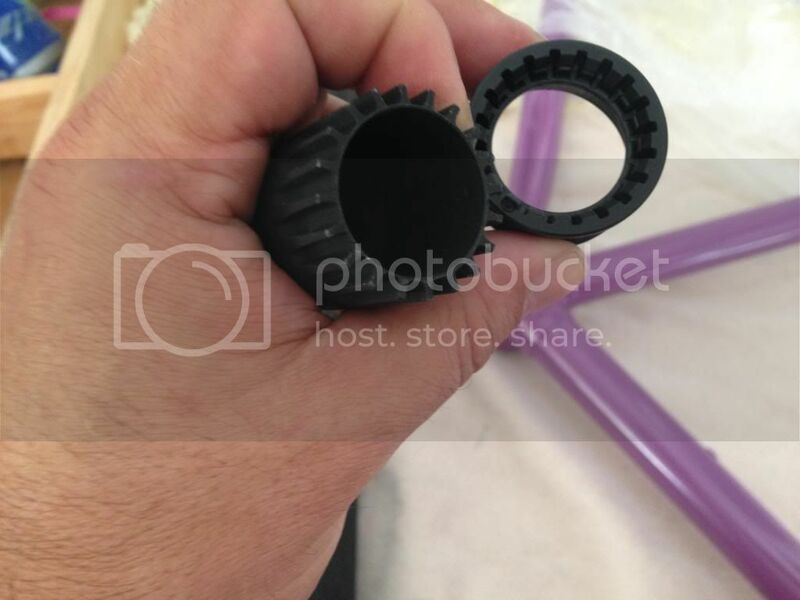 on the plus side, this new bb has sealed bearings, but on the negative side it has a plastic cup on the non-drive side (called the "adapter" in the bb instructions)...plastic cups are more difficult to thread than metal ones, and it's really easy to start them wrong and cross-thread them. so patience is required when using plastic cups. thanks, savo. i know that you have high standards so that means a lot coming from you. i thought about installing the crankset, but since i can't put the wheels on until i get the fork back & installed, i decided not to. cranksets are very strong so it wouldn't hurt it to be on the ground, but i want to keep everything looking pretty since this bike is going to be a gift. 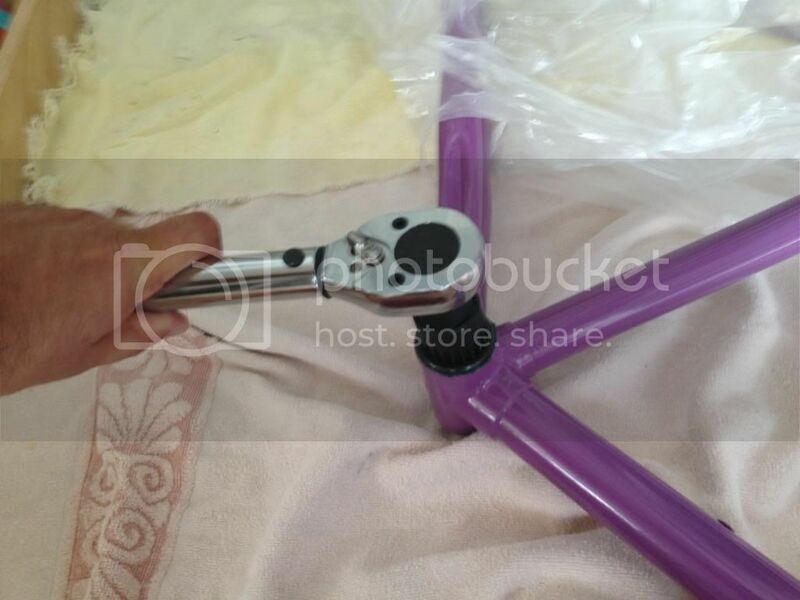 I really like the purple with the black components - that with the black paint on the rims is going to make it look very sharp... Very nice work Andre! thanks, rabin, i think it's going to look nice as well. i think that i'm going to take the decals off of the new wheels, they're a bit much for my taste. 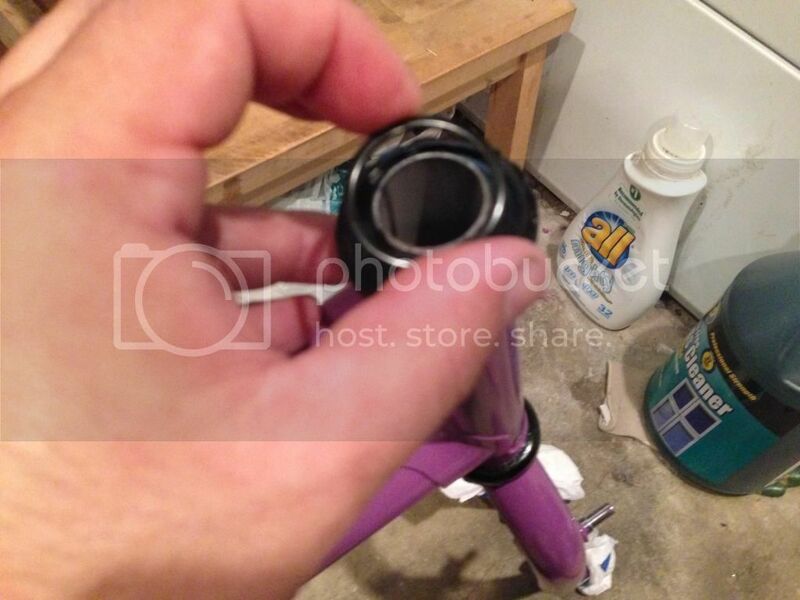 the bottom bracket (bb) i am installing is a low-end shimano part. it is a direct replacement for the old one, from which i took the measurements. i was looking back on this post and i realized that this word choice is a bit misleading. 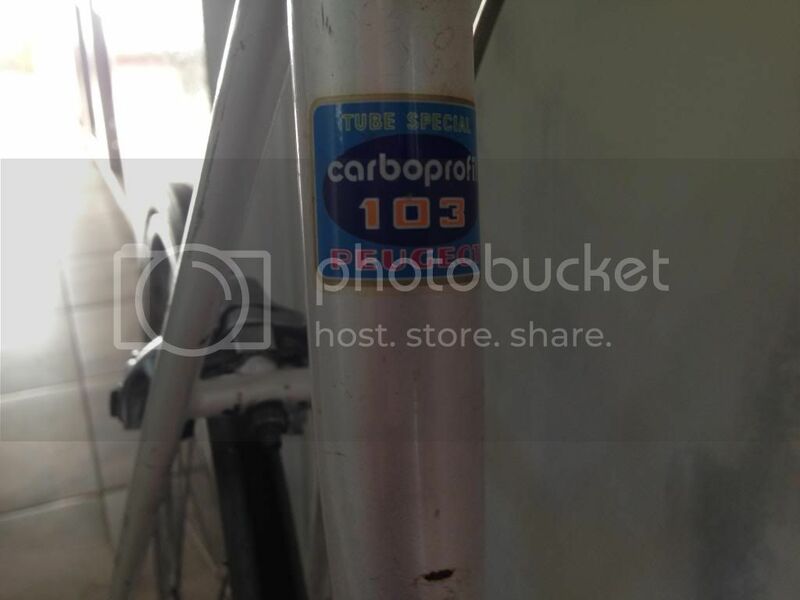 the original bottom bracket on this bike was a conventional square-taper unit, sized for a 68mm wide bottom bracket shell and using a 110mm spindle. the new crankset called for a 122.5mm spindle, so the new bottom bracket has that longer spindle size (68x122.5); the new crankset is a triple, which requires a bit more width on the spindle to clear the frame properly (as compared to the original double crank). 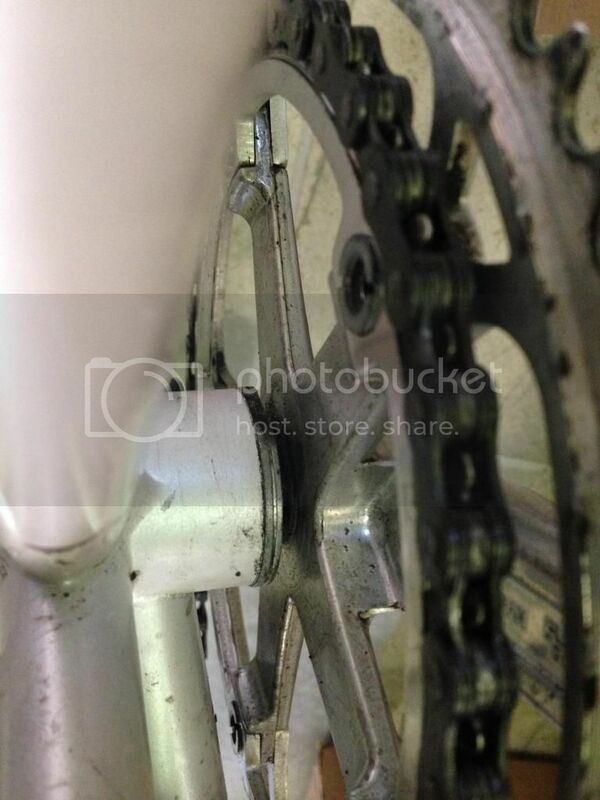 the choice of crankset determines the spindle length (and type). i'm still waiting for the many of the new components to arrive. my 2-3 week estimate was probably optimistic. this complicates matters in terms of component selection...i was thinking about using a shimano 105 component set, but the current ones use a technology called "hollowtech II" in which the bb has no spindle (you can look right through the bb), with the spindle being part of the drive-side crankset assembly...that's why the higher-end shimano groups have cranksets with no dust caps on them. which looks very cool. nobody makes a swiss-threaded hollowtech II bb, and i haven't yet found a hollowtech II threadless bb so i may have to chose another component group for this bike. i'm still determined not to make any irreversible changes to this bike. nobody makes a swiss-threaded hollowtech II bb, and i haven't yet found a hollowtech II threadless bb so i may have to chose another component group for this bike. okay, i was wrong about this. 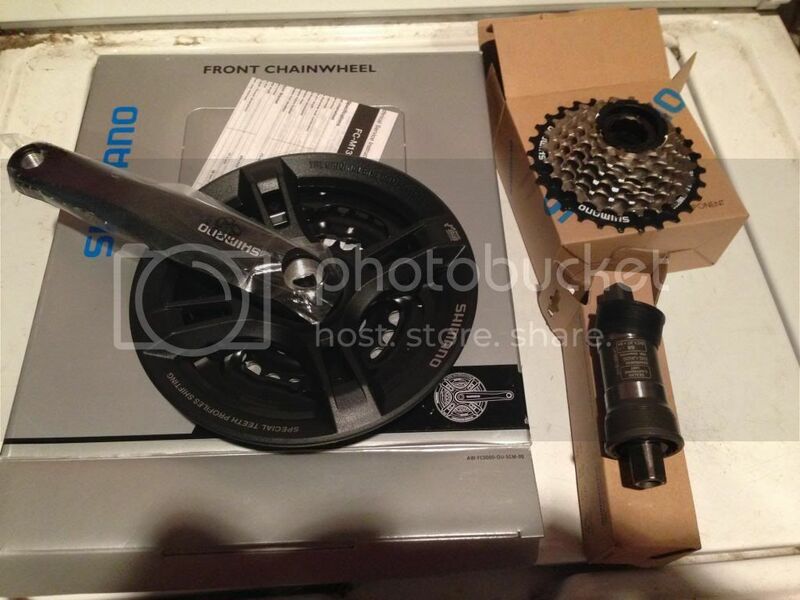 i sent an email to phil wood -- they make really nice bottom brackets and hubs for bikes -- and found out that they make a product that will let me mount a new shimano 105 crankset on my ph12. 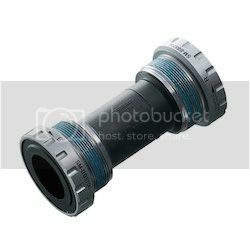 some background -- a conventional bottom bracket consists of the cups (which contain the bearings) and the spindle...most modern ones also contain a sleeve that goes between the cups inside the shell as well; this sleeve is typically attached to the drive-side cup. 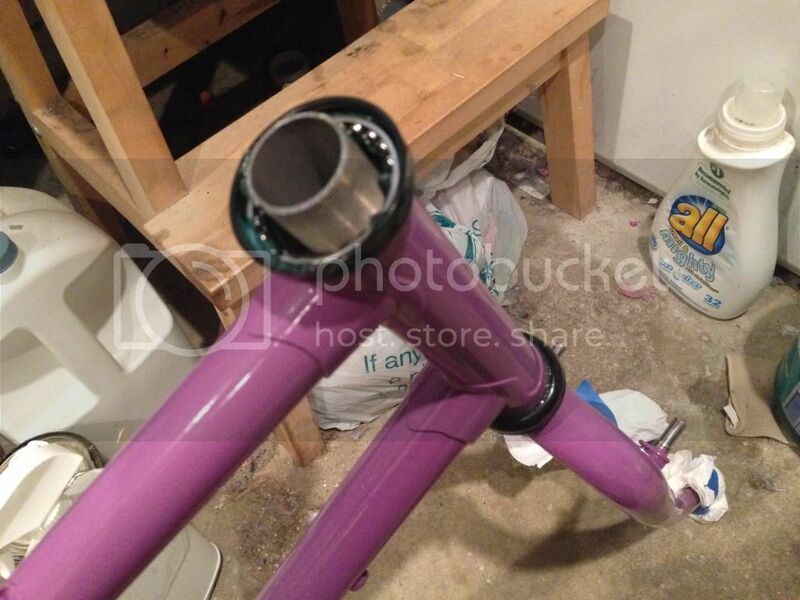 since the cups are screwed into the bottom bracket shell, the bearings actually fit inside the bb shell on the bike frame. of course, since all modern bikes are british threaded, this part is only available with british threading. 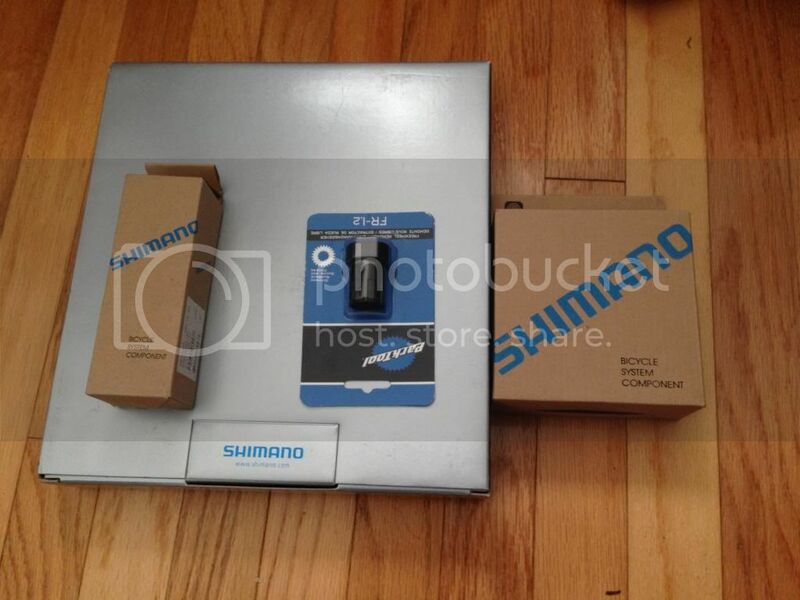 only two downsides -- it's expensive (about US$145 vs. $25 for the basic shimano 105 bb) and heavy (225 grams vs. 90 grams for the shimano part). there will also be a bit of spacing needed (probably) since the outboard placement of the bearings affects the chainline. still, i'm happy to have this option! had another client meeting in orange county this morning so i stopped by the powdercoaters and picked up the fork for my wife's bike. they did a great job, and only charged US$20 to sandblast & re-coat it! 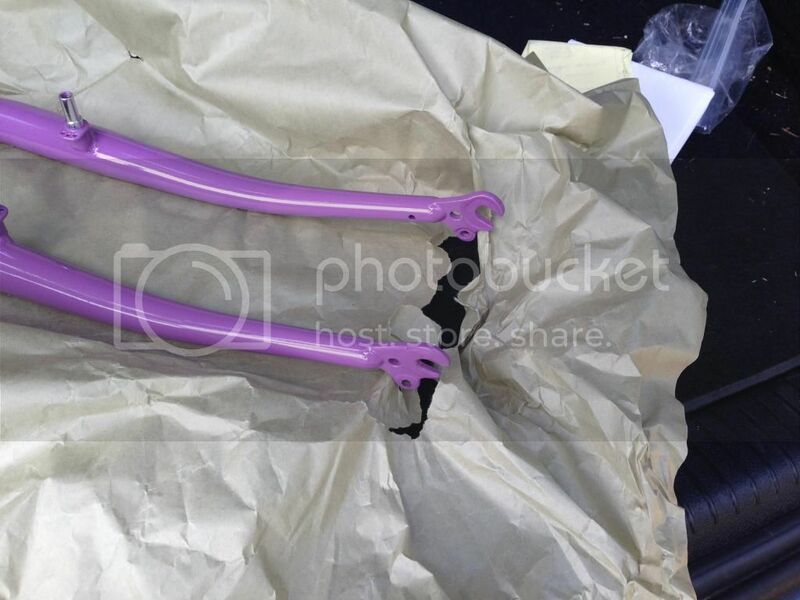 i had worked out a deal with the bike shop that screwed the fork up earlier, they were going to credit me on future repairs for the cost of having this done (since they were at fault) but this was so inexpensive that it's not worth the worry to deal with them again. now i have to find some time to finish installing the headset. i had a bit of time this morning between church, paperwork & home improvement tasks so i finished the headset installation on my wife's "new" bike. i still have to adjust the headset, i'll do that when i get the new stem. 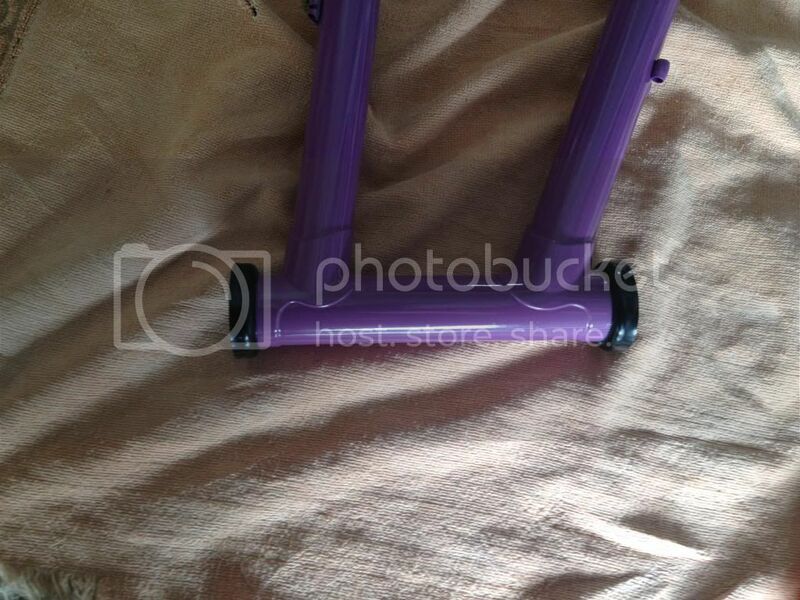 edit: i don't think i mentioned it earlier, but since this fork was new, i had to trim the steerer to fit the frame. the steerers on forks are made very long so that they can be trimmed to fit a variety of frames...to trim the steerer, one determines the necessary length by adding the length of the head tube to the length of the exposed portion of the headset (called the "stack height"). 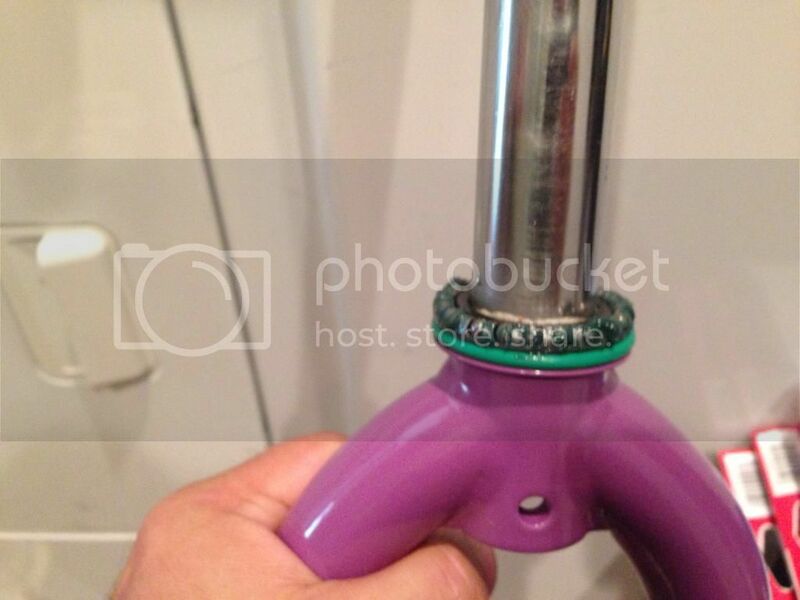 then, measuring from the crown race seat at the bottom of the steerer on the fork, you cut the steerer at that length. i used a hacksaw and a miter box (like one uses to cut wood trim) to get a straight cut, then i filed down the rough edge.